If you’re looking for easy pumpkin recipes, I’ve got you covered with these 30+ delicious pumpkin recipes. From canned pumpkin recipes to fresh pumpkin recipes, sweet pumpkin recipes to savory pumpkin recipes – there’s something for everyone. Pumpkin recipes are one of the biggest reasons I love October. I’m actually not a huge fan of pumpkin spice lattes (don’t hate me! ), but nearly everything else pumpkin flavored is on my “must indulge in this month” list. I will never forget the first time I had pumpkin flower soup and I am SO bummed that I have not found a way to recreate it yet. We had it when we went to Mexico once and it was so, so, so good! It’s been this mystery soup that I haven’t been able to make or enjoy since then though. Luckily, I’ve got plenty of pumpkin recipes you can make! There are over 30 delicious recipes here from drinks to dessert to meals and more. YUM! And if you’re looking for more fall-flavored foods, check out these Easy Apple Recipes or these 38 Delicious Fall Recipes. These Pumpkin Pecan Energy Bites on Hello Nature are a delicious fall-flavored snack. This savory pumpkin recipe is a must-have for your next hike! Looking for a sweet pumpkin dessert recipe that steps it up a notch? You’ve got to try these Mini Pumpkin Cheesecakes with Bourbon Pecan Caramel Sauce on The Wicked Noodle. They look delicious! Need a fall soup inspired by the flavors of the season? Try this Creamy Pumpkin and Garlic Soup on Recipe This. When it comes to pumpkin dessert recipes, these Pumpkin Cheesecake Hand Pies on The Bewitchin Kitchen might be my favorite. YUM! Kick the morning off right with a yummy pumpkin breakfast recipe. You’ll want to make this Pumpkin Bread on Morning Motivated Mom all October long. These Pumpkin Pancakes on Living La Vida Holoka are a staple of fall breakfasts for us. They’re indulgent without being too complicated. Great for Sunday brunch with the family! These Chocolate Chip Pumpkin Cookies on The Cookie Writer are a great way to add a little something extra to the typical pumpkin flavor. I love our Air Fryer and these AirFryer Mini Pumpkin Pie Delights on Recipe This give me even more reason to indulge in air fryer desserts. This Pumpkin Lasagna on Dining with Alice is a great way to enjoy a savory pumpkin recipe. Such a unique way to change up a weeknight dinner! Pumpkin Mounds on Hello Nature are a great way to add a little bit of fall to the breakfast table or even just to snack on! If you’re a fan of Harry Potter, or just want a delicious pumpkin drink recipe, you have to try this Harry Potter Copycat Pumpkin Juice on Hello Nature. It’s my go-to drink of the fall season! Trying to eat a little healthier? You won’t want to miss these Paleo Pumpkin Pie Dessert Nachos on Beauty and the Foodie. Make these Pumpkin Lush Bars on Cincy Shopper for Thanksgiving or just because. This fall layered dessert will be a staple sweet pumpkin dessert this season. Add this Pumpkin Spice Fruit Dip on Living La Vida Holoka to your next tailgating spread for something a little different, yet delicious. You’ll want jars of this Simple Pumpkin Butter on Graceful Abandon to get you through fall. SO easy and so tasty! Need a new fall snack? 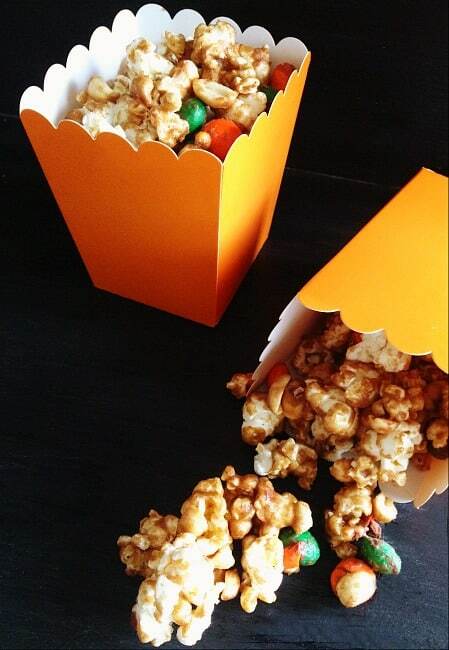 You won’t want to miss this Pumpkin Spice Popcorn on Hello Nature. It’s filled with flavors of the season that will make your mouth water. Another great pumpkin recipe for breakfast is this Easy Pumpkin Bread on Living Well Spending Less. Another great fall soup that you’ll be able to enjoy all season long is this Chicken and Macaroni Pumpkin Soup on Hello Nature. The combination of flavors in this easy soup recipe is delicious! Change up the standard pumpkin pie recipe and make this Pumpkin Meringue Pie on Ginger Casa. You might have a new favorite sweet pumpkin recipe for Thanksgiving! Looking for another pumpkin dinner recipe? You can easily make this Vegan Creamy Pumpkin Pasta on Mom Foodie. It’s a great way to eat a little healthier while you’re indulging this season. Love cheesecake? Your taste buds will thank you when you make this deliciously simple Pumpkin Cheesecake Dip on Hello Nature. Enjoy these Baked Pumpkin Spice Donuts on The Joys of Boys with your favorite latte or cup of tea. It’s a heavenly way to start the day! If you love monkey bread, you’ll love this fall twist on it! Try this Caramel Pumpkin Monkey Bread on The Typical Mom. More donuts? Why not?! These Delicious Baked Pumpkin Donuts on Living Sweet Moments are another tasty way to kick off the day. You’ll want to try this (Super) Spicy Pumpkin Soup on Craftify My Love if you’re looking for comfort food this fall. Want to wow your guests this holiday season? Make them this Pumpkin Spice Cream Cheese Braid on Living La Vida Holoka for breakfast! These Easy Pumpkin Pie Streusel Bars on Kindly Unspoken are a great way to enjoy pumpkin in bar form! Looking for a delicious pumpkin muffin recipe? Try these Chocolate Pumpkin Muffins with Maple Cream Cheese Frosting on Table for Seven. Want another cheesecake dessert that the family is sure to love? Make these Caramel Pumpkin Cheesecake Bars on Quirky Inspired. Who doesn’t love cake? This Pumpkin Cake with Cream Cheese Frosting on Cincy Shopper gives you even more reasons to love cake this fall. The combination of pumpkin and cinnamon is a delicious one! You’ll want to make these Pumpkin Pie Cinnamon Rolls on The Bewitchin Kitchen for your next weekend family breakfast. And don’t let your furry friends miss out on the pumpkin hype, too. Check out these Pumpkin Peanut Butter Dog Treats on Hello Nature. Thanks so much for including some of my pumpkin recipes! I am definitely a big pumpkin everything fan and will be trying some of these recipes! Pinning!